Four objects missing from the Egyptian Museum since the January Revolution have been returned, announced Dr. Zahi Hawass, Minister of State for Antiquities. 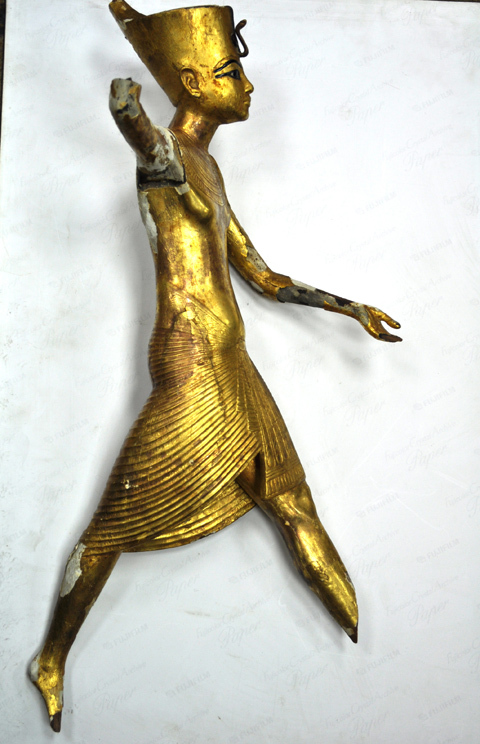 The objects returned include the gilded wooden statue of Tutankhamun standing in a boat throwing a harpoon (JE 60710.1). The statue suffered slight damage; a small part of the crown is missing as well as pieces of the legs. 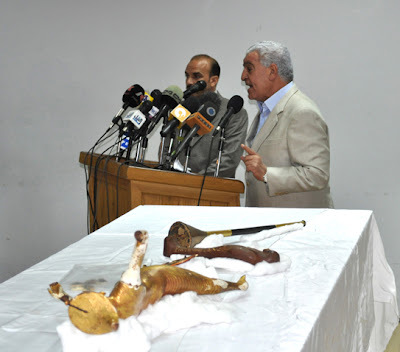 The boat is still in the Museum, and the figure of the king will be reunited with it and restored. 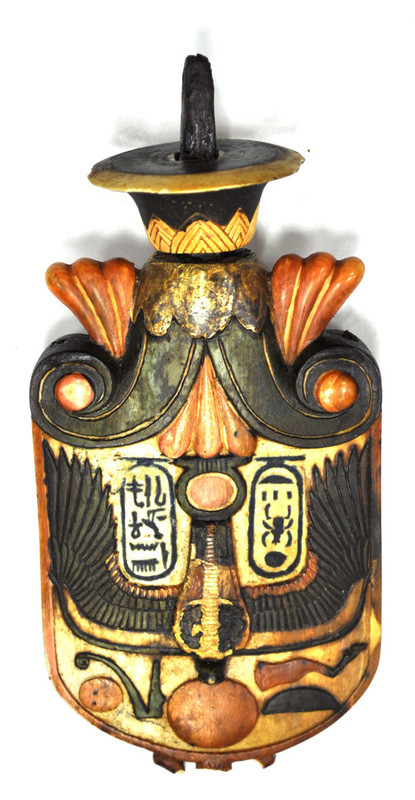 The second returned object is one of the 10 missing shabtis of Yuya and Tjuya (JE 68984). 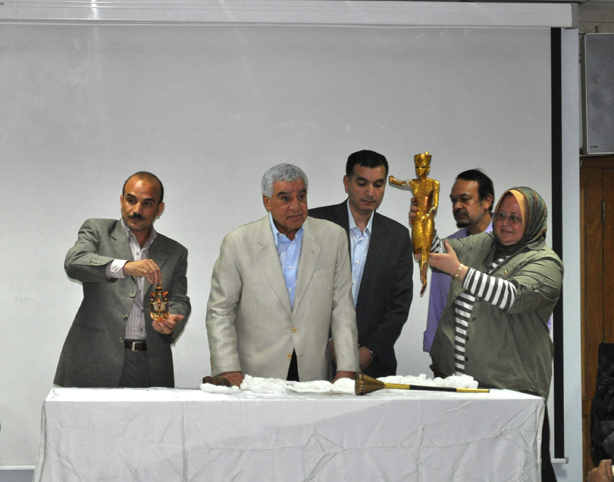 It is still in very good condition; it does not require restoration and will be placed on display again immediately, stated Dr. Tarek El-Awady, Director of the Egyptian Museum. 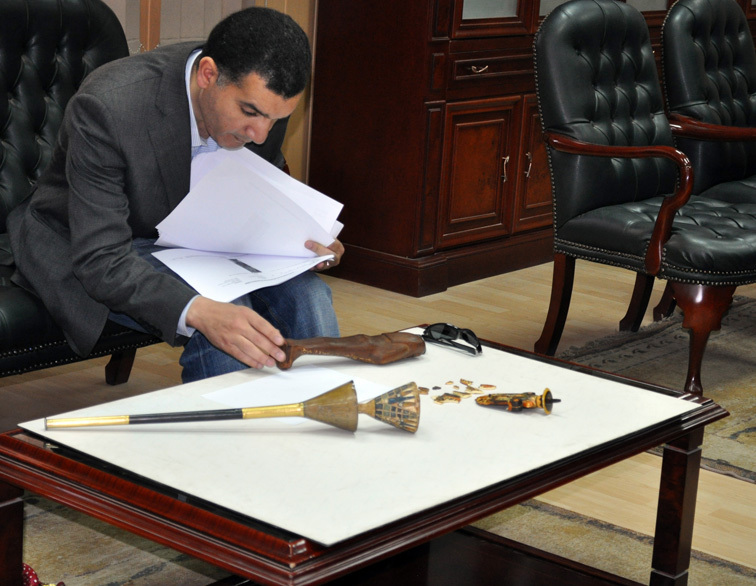 The third object is the gilded bronze and wooden trumpet of Tutankhamun (JE 62008). It was also received in excellent condition and will be put on display immediately. 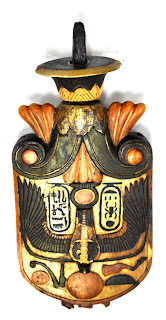 Also returned was a part of Tutankhamun’s fan. 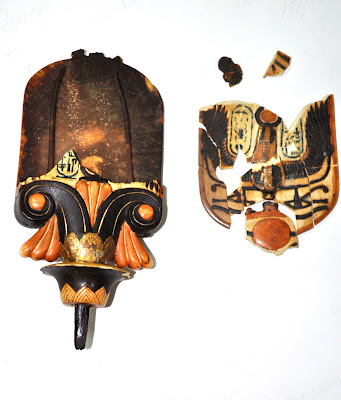 One face is in good condition while the other has been broken into 11 pieces. Part of the royal fan JE 62006 still missing. The objects were found by Salah Abd El Salam, an employer at the SCA, at Shubra El khaima subway (underground) station who brought it to Dr. Zahi Hawass this morning. 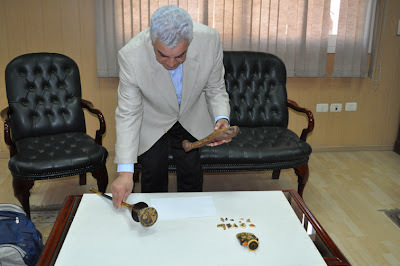 Dr. Zahi Hawass formed a committee immediately headed by Dr. Tarek El Awady (The Egyptian Museum curator) to check if the objects are genuine and after approving the authenticity of the objects the legal procedures were taken to hand those objects to the Egyptian Museum to restore it and put it back on display.